In the heart of the historical center, overlooking the charming Piazza Antinori, lies the building where the Hotel De La Ville is now located, one of the most prestigious and famous facilities in Florence. The hotel has always been a point of reference for famous guests including aristocratic Florentine families, politicians, and famous cultural and entertainment figures, drawn by the elegant and luxurious ambiance and top quality services which are offered to them. Hotel De La Ville offers its guests a wide range of accommodation choices: 71 rooms of all different types including suites, junior suites, classic, superior and deluxe rooms. ALl the rooms are soundproofed, furnished in a sophisticated and elegant style and equipped with exclusive bathrooms and top quality comforts. The suites at Hotel De La Ville are located on two floors connected by an internal staircase. The large first floor living room and bedroom on the second floor have independent entrances. Each suite can sleep up to 5 people: they have double and twin beds and 2 separate bathrooms . Junior Suites are spacious double or twin rooms with a large living area with sofas and a table. Some rooms overlook Piazza Antinori and the splendid facade of the Church of Santi Michele e Gaetano. The Junior Suites are all equipped with an exclusive bathroom with tub. 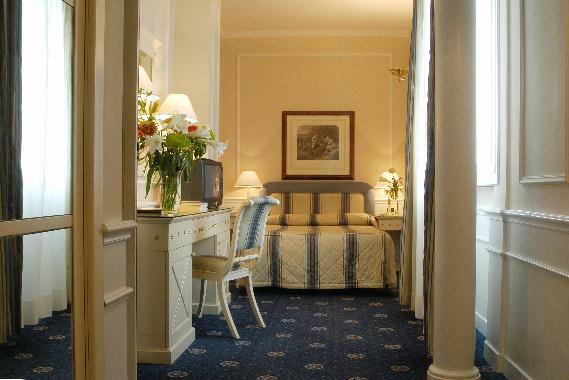 Hotel De La Ville has single and double rooms in the classic, superior and deluxe categories. The large size of the rooms makes it possible to add one or more beds to meet any need. All the rooms are equipped with a bathroom with tub and shower along with high quality comforts including: magnifying mirror, hair dryer, towel heater, air conditioning, minibar, Internet connection, direct dial phone, satellite TV and safe. An exclusive and elegant buffet is set up in our breakfast room every morning with a vast assortment of fresh fruit, fruit juices, yogurt, cereal, homemade pastries and a selection of cold cuts and cheeses, you can also sample our chafing dish of bacon and eggs. Guests can enjoy their breakfast with pleasant background. Lobby Bar offers a refined tasteful environment with its warm pomegranate upholstered furniture, where you can relax and listen to pleasant background music specifically designed for you. With your favorite after dinner drink at 50% off and a selection of assorted pastries. Out Concierge is available 24 hours a day to meet any need and desire such as reserving or suggesting a restaurant or tickets to the main museums and galleries in Florence, purchasing airplane or train tickets, reserving the airport transfer service and many other things. To learn about the beauties of Tuscany and beyond, the hotel organizes guided yours in the historical center of Florence and other important art cities such as Siena, San Gimignano, Pisa, Lucca, Perugia, Assisi and Rome. Guests can also take special tours dedicated to the food and wine of the Chianti hills and shopping in the numerous outlets of the area (The Mall, Gucci, Prada, etc.). Suites The suites at Hotel De La Ville are located on two floors connected by an internal staircase. The large first floor living room and bedroom on the second floor have independent entrances. Each suite can sleep up to 5 people: they have double and twin beds and 2 separate bathrooms . Junior suites Junior Suites are spacious double or twin rooms with a large living area with sofas and a table. Some rooms overlook Piazza Antinori and the splendid facade of the Church of Santi Michele e Gaetano. The Junior Suites are all equipped with an exclusive bathroom with tub. Rooms Hotel De La Ville has single and double rooms in the classic, superior and deluxe categories. The large size of the rooms makes it possible to add one or more beds to meet any need. All the rooms are equipped with a bathroom with tub and shower along with high quality comforts including: magnifying mirror, hair dryer, towel heater, air conditioning, minibar, Internet connection, direct dial phone, satellite TV and safe. 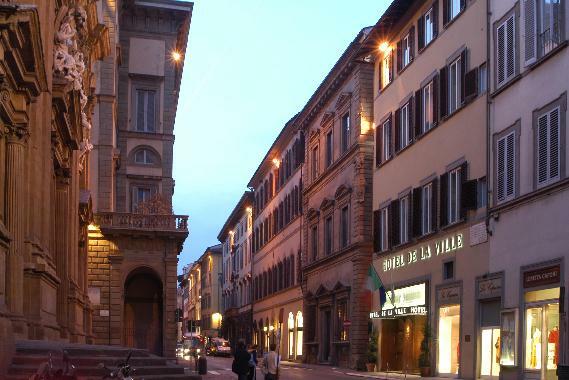 Hotel De La Ville is located in Piazza Antinori, in the heart of the historical center of Florence, right in front of one of the most representative buildings of seventeenth century Florence: the Church of Santi Michele e Gaetano. Around the hotel are characteristic charming alleys lined with majestic Renaissance buildings and luxurious elegant streets like Via Tornabuoni with its designer boutiques including Gucci, Prada, Cartier and Tiffany. Strolling around in the area near the hotel one immediately gets the true sense of the city: the age-old artisan workshops which seems to remain unchanged over the centuries, the architectural wonders of the Duomo, Basilica of San Lorenzo and Piazza della Signoria, and the delicatessens and trattorias for discovering the authentic tastes of tradition. The origins of the Church of Santi Michele e Gaetano date back to the eleventh century, but the original building was radically changed around 1600. The external facade is built entirely of pietra forte and represents a sublime example of Florentine Baroque. The sides of the chapels contain on of the most important seventeenth century marble cycles with marble statues depicting the Apostles and Evangelists. Upon request Hotel De La Ville may organize for its guests a transfer service to and from Florence's airport. The distance from the airport to the hotel is around 5 km. From Santa Maria Novella train station you can take a taxi or walk to Hotel De La Ville. From the square in front of the station take Via degli Avelli which flanks the Church of Santa Maria Novella and then take part of Via Belle Donne until you run into the street on your left which leads to Piazza Antinori, where Hotel De La Ville is located at number 1.